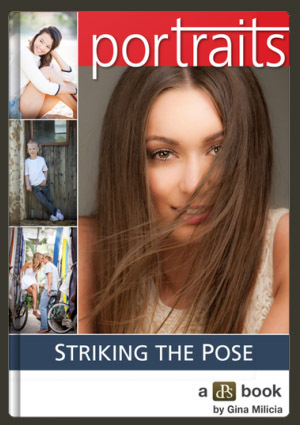 Want some good tips on photography poses for 6 people? This article includes solid techniques for posing groups of 6 people and has sample poses that you can copy. Mastering good posing technique is a life-long process and its something I try to work on continuously. 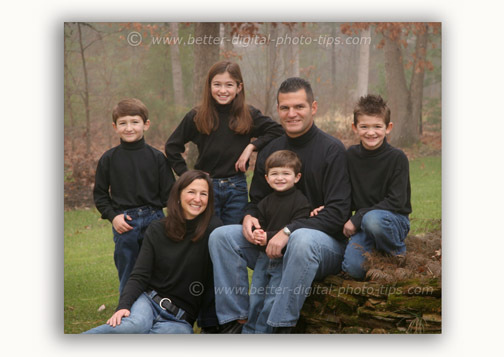 The family of 6 below was photographed outside in their yard in foggy weather. I found a small landscaping wall that gave me the chance to create different levels for their head heights. One of the photographing posing techniques is to use geometric shapes to help create a well-posed portrait. If you connect the subjects' heads in the photo above, the resulting shape resembles a sideways teardrop. Three of children were able to stand upright to be in a good spot. After the outside photos were taken, we moved inside to create the tight arrangement below. It is very much a similar teardrop shaped pose except my subjects are in quite close to each other. The next 2 examples are variations of placing two people placed above and behind four in the composition. These family group poses have a trapezoidal shape. These two ladies were long-time best friends and wanted to pose with their children. The children are all small and this is a good situation for this kind of pose. Coordination the clothing with any group pose of people improves the end result. The black and white clothing, combined with the neutral-colored background, bring out the flesh tones of the subject nicely. 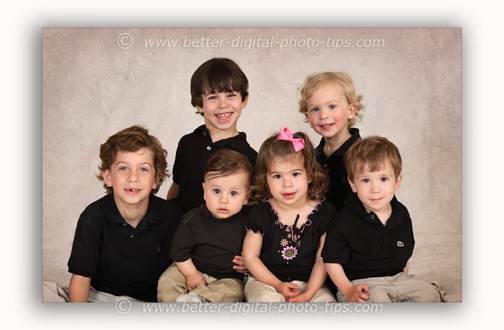 With a photo of 6 children like the one below, it takes a lot of patience to get each child in just the right position. I had the two children in the back row on their knees and the 4 children in the front row were sitting. I wanted to get the children as close as possible to each other so that I could zoom in. Photography poses for 6 people can be complicated. There are so many more variables with the larger number of people and their sizes as well as how to get their relative location just right. 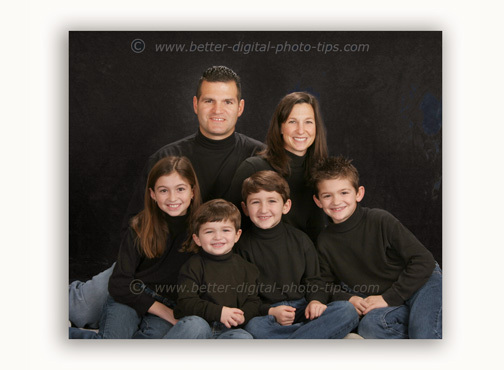 On a side note, go back and look at the 4 family portraits above. Which one is different for another reason? Did you notice that there were nothing but matching solid colored clothing in three of them. In the photo of the two sisters, the ladies shirts have patterns which can be distracting. In this particular pose, the distraction is minimized because their shirts are mostly hidden. It also helps that the patterns are black and white and match the colors of the children's clothing. 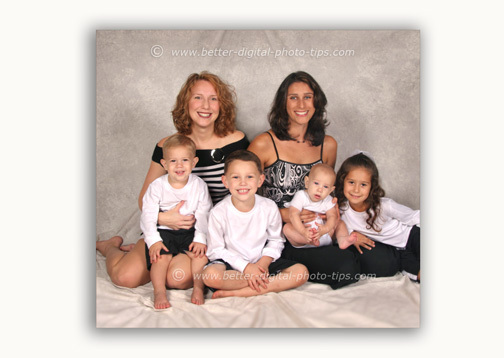 These examples all show how to pose 6 people in a group portrait when some of the subjects are children. Sample photos of groups of 3 people. 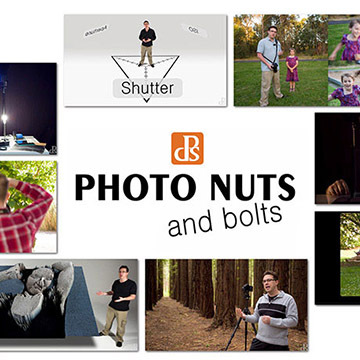 Five sample photos that you can copy for groups with people of different ages. 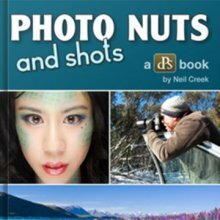 Photography Tips for 4 People. How to do poses for groups of 4 people. 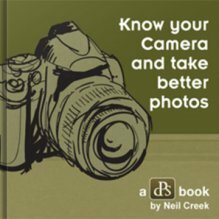 Photography Tips for 5 People. Family posing ideas for groups of 5 people. 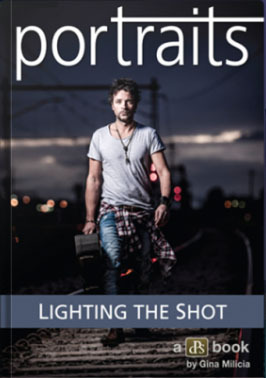 Portrait Photography Books are also a great way to get ideas for good posing technique.